This product was added to our database on Wednesday 24 June 2015. 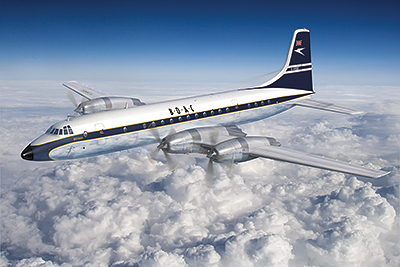 Bristol 175 Britannia – British four- engine turboprop passenger plane, designed in the late 1940s by the Bristol aero manufacturer. Series production began in the mid-1950s, and the first flight with paying passengers was at the beginning of 1957. The Bristol 175 Britannia was intended to be the flagship airliner of the leading British airline B.O.A.C., but several technical problems held back its development, limiting the production of the type to 86 units. A passenger favourite, first of all for special comfort, it was relegated to the second tier with the advent of the American Boeing 707. BOAC used 33 planes of this type, and the rest were sold to Canada, Cuba, Spain, Mexico, Israel, Argentina and other countries. Separate machines were converted as transports. As a passenger plane it was used up to the beginning of the 1980s, and as a transport continued to fly in the mid-1990s.